People all over the world ignore their bedtime from time to time. We’ve all been there: staying up late at night now and then is not something to worry about, but when one starts doing that on a regular basis, it turns into a serious issue. Sleep is an essential process and not getting enough of it may result with sleep deprivation, which will surely impact both the physical and mental system. In time, this will cause you chronic health issues and have a negative effect on the quality of your life. A person needs to sleep as much as he or she needs to breathe and eat. It is entirely individual how much sleep one needs. Experts say that adult people should get seven to nine hours of goodnight’s sleep in order to feel well rested and alert. Yet, this span of time depends on the person’s genetic and physiological factors. Age, gender and sleeping patterns are additional significant factors that we also need to take into consideration. If a person regularly runs short on sleep because of workload, busy family life, or other reasons, it is important to make proper lifestyle changes to enable adequate sleep and prevent the bad consequences of sleep deficiency. In addition, we will go through the most dangerous consequences when a person does not get enough sleep. When you spend the night awake, the chances are high that you will find it difficult to concentrate and focus the following day. Good quality sleep is crucial for your cognitive functions and plays a major role in the process of reasoning and learning. The lack of sleep can impair your concentration, attention, reasoning, alertness, and problem-solving skills. Consequently, this affects the learning capacity. Lack of sleep can also have a negative impact on both your short- and long-term memory. A study from 2007 points out that lack of sleep directly influences the person’s cognitive performance. Sleep deprivation results in weak working memory and poor attention, together with a number of additional cognitive issues. In order for the human brain to maintain its proper functioning, you simply need to have a proper sleep. Proper sleep and rest are vital for the health of your heart. Lack of sleep increases your risk of cardiovascular disease – no matter the age, weight, exercise, and smoking habits. Sleep has an important role in the body’s ability to repair and heal the heart and blood vessels. A study from 2000 analyzed how lack of sleep affects the neural circulatory control. This study showed that lack of sleep increases the resting blood pressure and decreases muscle sympathetic nerve activity. Furthermore, a 2009 study claims that short-term lack of sleep changes blood pressure, hormones, inflammation, and autonomic tone in a direction which contributes to the occurrence of cardiovascular disease, first of all, atherosclerosis. Another study from 2011 found that persons who sleep less than six hours increase their chances of developing coronary heart disease and stroke, in comparison with those who sleep seven to eight hours per night. On the other hand, excessive sleep can also lead to poor cardiovascular health. Considering the fact how lack of sleep impacts your heart, it is clear that you definitely should not sleep less than six hours at night. Lack of sleep can also have a negative impact on the immunity, a system which is purposed to fight against infections like the flu, the common cold, and other diseases. 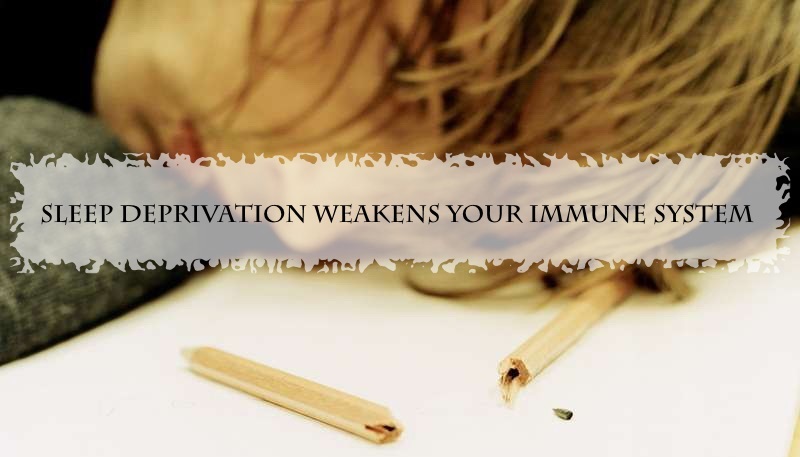 When your immunity does not function properly, the body becomes liable to viral and bacterial attacks. While a person is sleeping, the immune system produces proteins known as cytokines and other antibodies that fight infection, thus protecting the body against inflammation or infection. Lack of sleep deprivation reduces the production of cytokines, which in turn lowers the body’s capacity to defend itself against common colds or bacterial infections. A study from 2012 explains how the diurnal rhythmicity and granulocyte levels are directly influenced by the acute lack of sleep. Such changes reflect the immediate response of the immune system upon stress exposure. Since sleep deprivation makes the body more liable to the common colds and the flu, it is vital to take the necessary steps that will help a person to have a proper sleep.